The methodical features of measuring the power of acoustic radiation of model panels in the field of aerodynamic pressure pulsations are considered. We show the possibility in principle of using intensimetry in the near field of a vibrating surface. We establish the effect of static loading of the panel on the power of its acoustic radiation in the vicinity of the first resonant frequencies. It is shown that the effect decreases with increasing frequency. Translated from Izmeritel’naya Tekhnika, No. 12, pp. 51–55, December, 2018. R. G. Abdrashitov and A. Ju. 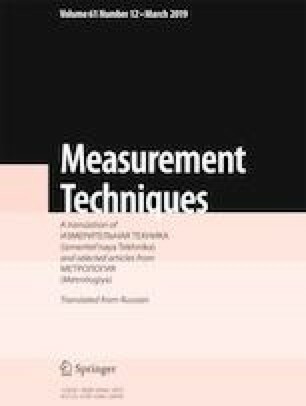 Golubev, Identification of Noise Sources in the Cabin and Determination of the Sound Energy Local Passage Through the Board Design Based on the Results of In-Flight Measurements of the Superjet, American Institute for Aeronautics and Astronautics (AIAA) (2015), DOI: https://doi.org/10.2514/6.2015-3114.